The International Corrosion Prevention Symposium for Research Scholars (CORSYM-2014) intends to familiarize students and young research scholars with the basic and practical aspects of corrosion, its effects and protection issues. This symposium enables excellent networking opportunities and forms an important link between research scholars and corrosion scientists working in the corrosion field from all over the world to manage corrosion by a meaningful approach. The symposium programme will include plenary lectures, oral and poster presentations supported by NACE International and Gateway India Section. The International Corrosion Prevention Symposium for Research Scholars (CORSYM-2014) intends to familiarize students and young research scholars with the basic and practical aspects of corrosion, its effects and protection issues. This symposium enables excellent networking opportunities and forms an important link between research scholars and corrosion scientists working in the corrosion field from all over the world to manage corrosion by a meaningful approach. major oil discoveries, including the Mangala, Bhagyam and Aishwariya Fields. 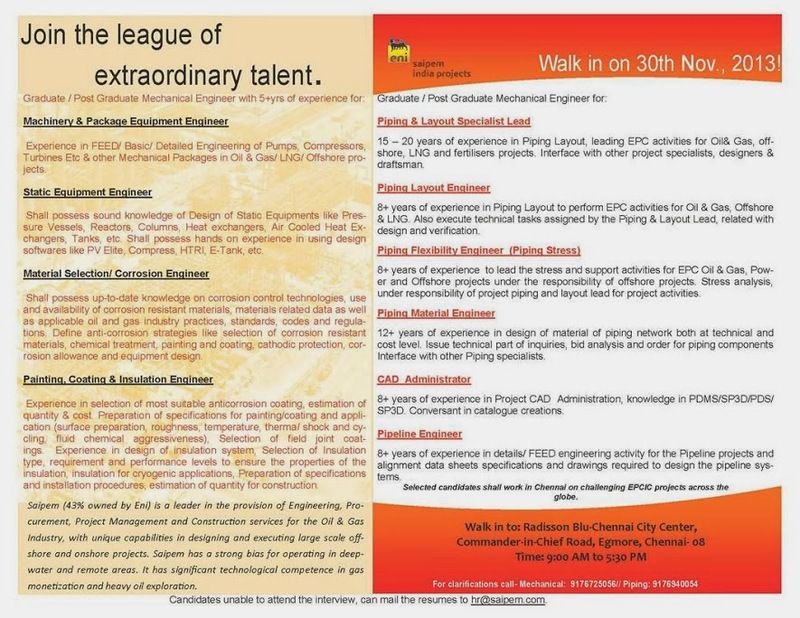 To meet the resource requirement CIL intend to award contract for Corrosion study interested competent party. The brief scope of work of the contractor under this contract is to carry out Corrosion study as per the requirement of CIL for Rajasthan asset. 1. To complete the corrosion study/ assessment by site visits, carrying out ICDA and to identify key corrosion areas with clear recommendations to mitigate corrosion threats to maintain corrosion rate < 3mpy. 3. The corrosion study is a time bound activity and to be completed in 8 months’ time from the start date of Phase I study. 4. The contract is applicable for Mangala infield assets and interconnecting pipelines Contract by its technical methodology has been split into phases at sole discretion of company. NACE International Honors Dignitaries for their Contribution towards Corrosion Awareness New Delhi, October 2, 2013: In order to appreciate the work done by the corrosion fraternity, NACE distributed Corrosion Awareness Awards on Wednesday to acknowledge the contributions of the individuals and organizations. The awards recognize individuals who have made a significant contribution to the corrosion industry. For distinguished Senior Citizen for his life time contributions to the activities for the growth & development of: NACE International & NIGIS, Corrosion Science & Technology, and Corrosion Awareness in India. 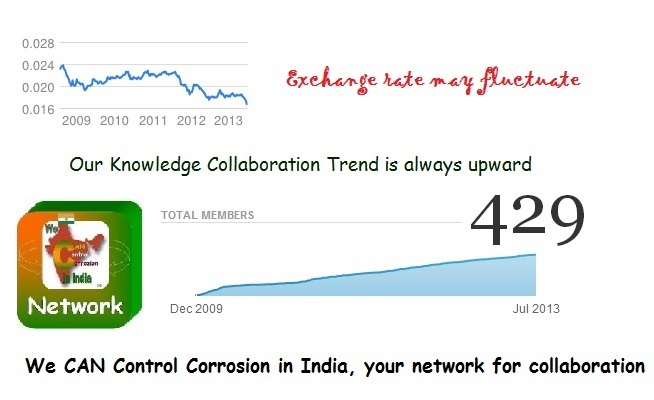 India - Corrosion, a life cycle challenge - Pump Selection, a Puzzle for Public and Material Selection, a Challenge for Pump Manufacturers. When Pumps come to the minds of public for domestic application, the selection of pumps is always a puzzle for them. The moment the requirement is identified, the users merely check certifications like ISI mark, the only clue available for making a purchase decision. The technical knowledge required for proper selection of pump set and pipe sizing is clearly out of the reach of public, especially farmers, who are the final consumers. NACE International, the ANSI accredited TAG administrator for ISO TC 35 and ISO TC 156 is looking for additional US TAG members to actively participate in responding to ISO standards. ISO TC 35, Paints and varnishes, also includes subcommittee SC 12, Preparation of steel substrates before application of paints and related products, and SC 14, Protective paint systems for steel structures. The overall scope of ISO TC 35 is Standardization in the field of paints, varnishes and related products, including raw materials. ISO TC 156, Corrosion of metals and alloys, has a scope of Standardization in the field of corrosion of metals and alloys including corrosion test methods and corrosion prevention methods. General coordination of activities in these fields within ISO. Participation in US TAGs is limited to US national interested parties but NACE members outside the US can participate in their countries. US national interested parties are defined as an individual representing a corporation or an organization domiciled in the U.S. (including U.S. branch offices of foreign companies authorized to do business in one or more states as defined by the relevant State’s Corporation law within the U.S.); an individual representing a U.S. federal, state or local government entity; or a U.S. citizen or permanent resident. U.S. national interested parties who are directly and materially affected by the ISO committee work and have an interest becoming a TAG member may contact TAG administrator Ed Barrett at Ed.Barrett@NACE.org or 281-228-6295. NACE members outside the U.S. may also contact Ed for information on how to participate in your country. Corrosion induced water pipeline leakage accounts for greater loss in precious water sources and also poses contamination threats to public health. The Pamban road bridge, connecting the mainland to the pilgrim town of Rameswaram, will be closed to traffic for 40 minutes every day for the next two and a half months as renovation works gain momentum. The Rs 18.57 crore upkeep and renovation work of the 2.345 km long bridge began on April 11 in the lead up to its silver jubilee next year. The Annai Indira Gandhi Bridge was inaugurated by late Prime Minister Rajiv Gandhi on October 2, 1988. The bridge was closed to traffic for 20 minutes on Monday as M. R. Hitech Engineers Private Ltd., which has entered into a joint venture with the Chennai based Trinity & Co., began replacing the existing 592 Elastomeric Neoprene bearings with new ones. The National Highways has entered into an agreement with the two companies to complete the work in a year. Trinity & Co. will do the anti-corrosive painting work, while M R Hitech Engineers, the engineering and electrical works, sources said. The bridge has received anti-corrosive coats of paint only twice- in 1992 and 2002. Situated in the world’s second most corrosion-prone zone, the bridge would need a protective coat of paint every five years, sources said. Washington, DC, February 13, 2013 - The U.S. Chemical Safety and Hazard Investigation Board (CSB) and the California Division of Occupational Safety and Health (Cal/OSHA) today released a technical evaluation report on piping samples taken from the Chevron Refinery in Richmond, California, where a hydrocarbon release and massive fire occurred on August 6, 2012. Cal/OSHA participated in this technical evaluation as part of its enforcement investigation. The report, prepared by Anamet, Inc., a metallurgical laboratory in Hayward, California, concludes that the 8-inch steel pipe, from a section designated as 4-sidecut which was installed in 1976, ruptured due to severe sulfidation corrosion, and that tested pipe samples showed a very low concentration of corrosion-inhibiting silicon. 1. Rupture of the 8-inch 4-sidecut resulted from wall thinning caused by sulfidation corrosion. 2. Post rupture corrosion destroyed fracture morphology that could have indicated the rupture initiation site. However, rupture likely originated in the thinnest region and initially followed a longitudinal path driven by the hoop stress. Consequently, an area of likely rupture initiation was identified. 3. The wall thickness of the ruptured section was less than all the other sections of the 8-inch 4-sidecut that were evaluated. 4. Chemical analysis showed the silicon concentration of the ruptured section was 0.01-wt%. 5. Six of twelve specimens (50%) from unique sections of the 8-inch 4-sidecut, 12-inch 4-sidecut, and 2011 12-inch samples were found by chemical analysis to have a silicon concentration of less than 0.1-wt%. 6. Deformation of a small region of the 8-inch 4-sidecut rupture edge was consistent with mechanical force applied from the outside surface of the pipe, possibly from a fire pike, such as samples E-099 and E-082-2, or other pointed object. This deformed region was located within the area of likely rupture initiation. Cal/OSHA has already issued 25 citations and civil penalties of $963,000. Chevron has announced it will appeal these citations. India - Pre Budget Memorandum 2013-2014 - How do you view increase in depreciation rate called by Engineering associations? 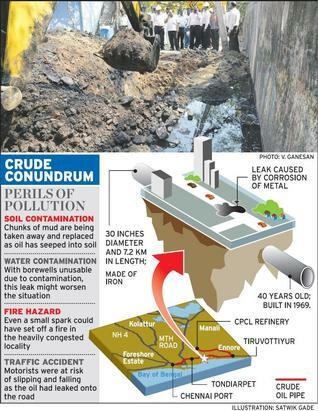 India - Corrosion induced Oil Pipeline Leak worries residents in Tiruvottiyur, Chennai. CPCL asserts facility health through external protection by CP. Is internal corrosion overlooked? CECRI (Central Electro Chemical Research Institute), Karaikudi, established in 1953, is one of the pioneering research institutions in the field of electrochemical science and technology. Governed by CSIR (Council of Scientific and Industrial Research), and guided by a team of highly qualified and internationally acclaimed scientists, it has evolved as the largest institute in Asia focusing on the electrochemical sciences. The present R&D thrust is on Fuel cells, Batteries, Corrosion science and engineering, Electrochemical instrumentation, Electrochemical materials science, Electrochemical pollution control, Electrodics and Electrocatalysis, Electro metallurgy, Functional materials, Industrial metal finishing, Electroplating and Nanoscale electrochemistry, to quote a very few from a large spectrum of ongoing activities. CECRI has been hosting a prestigious four year, eight semester B.Tech program in Chemical and Electrochemical Engineering since 1988, with the goal of initiating scientific temper in the bright, evolving generation of India. The admission for this course is through the unified single window admission system of Anna University. The course is a unique and a judicious blend of Chemical and Electrochemical Engineering. The curriculum includes chemical engineering subjects like Process calculations, Chemical engineering thermodynamics, Fluid mechanics, Equipment design, Heat and Mass transfer and Electrochemical engineering subjects like Electrodics & Electro catalysis, Electrochemical reaction engineering, Corrosion science & engineering, Electrochemical energy storage systems, Electroplating etc. The students also get an opportunity to work hands-on during the practicals. Kindly refer the following link to know more about the syllabus. An aspect of its singularity is that the course is conducted by eminent scientists and engineers, who are personally involved in various research and developmental activities of Electrochemical Science and Technology. With a highly-focussed objective of moulding the aspiring and intelligent young minds into great technologists, CECRI provides them with real time exposure on flag-ship research projects that focus on finding solutions to the significant problems faced by the industry. The intensive industrial internships and the students involvement in various activities such as event management, participating in national and international seminars make them job-ready-professionals when they enter their fourth year. 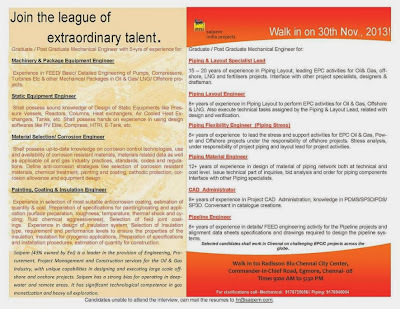 The constant guidance by the eminent alumni of CECRI in the form of seminars, interactions and sharing of experiences enable our students in touch with the dynamics of the industry. We welcome you for an exclusive visit to our campus where you can find an enabling atmosphere. We will be too pleased to extend our assistance such as guest house accommodation, transport etc. to make the recruitment process, a truly remarkable experience. We earnestly look forward to your esteemed visit to our campus. We can also arrange an online interview through video conferencing. Corrosion iPhone app developed by University of Toronto engineering student Jason Tam is finding a grateful audience among professional engineers and engineering students. Tam created the app last year when Professor Steven Thorpe asked his MSE 315 Environmental Degradation of Materials students whether anyone would be interested in developing an app that provided corrosion terminologies, formulae, and benchmarking data. Thorpe had originally hoped to find an existing app that students could use in the course, which primarily deals with electrochemical and corrosion behavior of engineering materials in various applications. He could only find one less-than-ideal app in the iTunes store that didn’t even spell 'corrosion' correctly. The app now sells for 99 cents on the iTunes app store and all proceeds go to the George B. Craig Scholarship, an in-course award designated for an academically high-performing upper-year Materials Engineering student with demonstrated financial need. The app includes a glossary of more than 300 technical corrosion engineering terms, a list of constants, such as the Boltzmann constant, reference electrodes and schematics, and even virtual corrosion experiments. For example, you can explore crevice corrosion on the Titanic. We are pleased to inform that NACE International Gateway India Section in association of NACE International is organizing a conference “Bring on the HEAT” (BOTH) from 18 - 19 April 2013 at Hotel Mirage, Mumbai. The last date of abstract submission is 23 February 2013. We request you to confirm the receipt of this letter and your intent for the participation in this conference as early as possible. This will enable us to keep you informed / updated with regard to other activities of the conference. Look forward to your active participation at BOTH. If you need any assistance, please do not hesitate to contact us. Japanese firm Hitachi, on Friday, announced that a consortium comprising Hitachi and Hyflux had signed an agreement with Dahej Special Economic Zone (SEZ) for a sea-water desalination project in Gujarat. The consortium signed a water purchase agreement with Dahej Special Economic Zone in Gujarat, Hitachi Ltd said in a statement issued here. The consortium plans to construct a sea water desalination plant in an industrial park within Dahej SEZ, and provide a stable supply of industrial water over a period of 30 years (including the construction period). “Hitachi will work closely with Hyflux to successfully implement the project, in order to facilitate the use of water resources in Dahej SEZ in Gujarat,” Hitachi president Hiroaki Nakanishi said. The project involves construction of a 336,000 m³/d seawater desalination plant in an industrial park within Dahej SEZ in Gujarat and stable supply of industrial water over a period of 30 years (including the construction period). It is one of the Delhi-Mumbai Industrial Corridor Projects being promoted jointly by the Japanese and Indian governments, involving the construction of industrial parks between Delhi and Mumbai (approximately 1,500 km) utilizing private sector capital. The consortium will conduct discussions toward the final agreement with DSL planned for around fall 2013, after obtaining environmental assessment approval and achieving the financial close. India - Research and Technology - How Indian companies can change the future of research? Although IITs and a few top-notch institutions exist in India, many of the new colleges that have come up in the past 20 years lack necessary infrastructure. At the same time, research bodies too have lost touch with the needs of the country and the industry and cater to a programme that runs on churning out PhDs instead of working on innovations. The absence of a dependable and equipped higher education system in the country and a bureaucratic scientific tradition has thrown up a massive casualty: research. Apart from companies, the government also appears to be convinced that the private sector can play a huge role in research. This is the reason why, after having extended invitations under the public private partnership (PPP) route to the industry to collaborate on building roads, airports, railways and water, the government sees a huge role for the private sector in research and development (R&D) as well. This collaboration between companies and campuses has been cemented under the National Functional Knowledge Hub project. The Federation of Indian Chambers of Commerce and Industry (Ficci) started the knowledge hub programme and has planned five such regional hubs in the country to facilitate industry-academia linkages. "These programmes help the institutions to expose their students to the cutting-edge demands of their industry. It also helps companies find solutions through the research work done at these campuses," says Shobha Mishra Ghosh, head of education at Ficci. MUMBAI: Larsen a Toubro has secured an offshore contract valued at Rs 749 crore from the Oil & Natural Gas Corporation (ONGC) for total 'EPCI' - Engineering Procurement Construction a Installation of four wellhead platforms. The contract was won against international competitive bidding. The project, spread over the Mukta, Bassein and Mumbai High South fields is part of ONGC's strategy to develop marginal fields to meet India's rising energy demands. 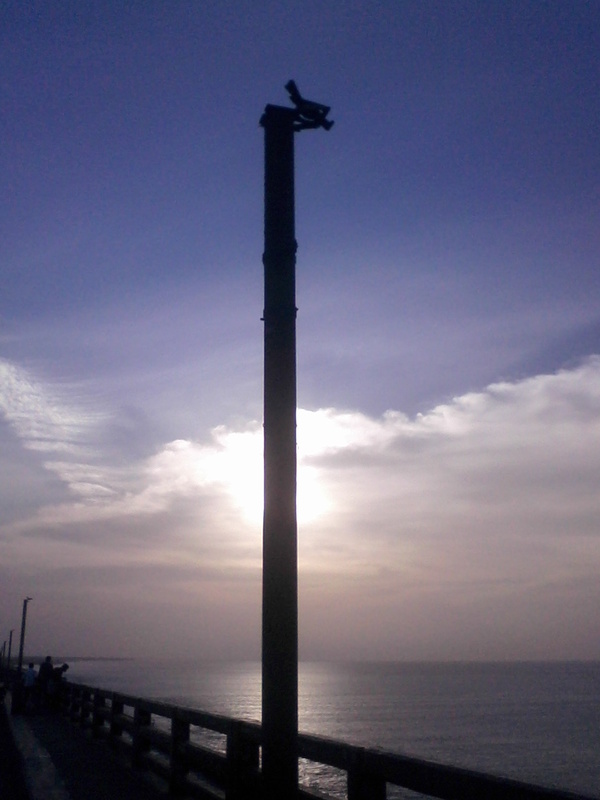 L&T is scheduled to complete the project by April, 2014. In addition to conventional wellhead facilities, one of the platforms, viz., the 8-127, will also have process gas compression facility.